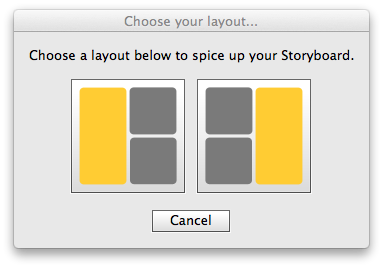 Advanced settings file (allows advanced users more control over Storyboard’s functions). It’s the most hands off we could make it. Just select the images you want to Storyboard and if they meet the criteria for this type of layout, only then do we prompt you! No unnecessary mouse clicks for the speediest workflow. No cropping occurs to your images in these type of layouts. They appear just as you have them in your full res files! Works with two horizontals + one vertical, but also with two squares + one vertical or any combination of a square/horizontal + one vertical. Still works in conjunction with our reordering window! It’s quite often that your blog post will feature several full width images mixed amongst your diptychs/triptychs (i.e not every image in your blog post is a diptych or triptych). Instead of having to run each of these images, one at a time, through Storyboard for the resizing and action benefits, now you can just select all the images you want as your full width images and then hold shift+alt (Windows) / shift+option (Mac) and click the Open button. They will all be resized perfectly for your blog and any actions you have setup in your preferences will be run as well. Time saving win! This feature is CS4 and CS5 only. Sometimes you may need extra functionality from Storyboard – maybe with transparent background, needing the Adobe RGB color space or even running an action on each individual image in a storyboard – well now you can specify these changes in an advanced settings file. This file can been found in the “include” folder of the Storyboard X.X folder that you installed into the scripts folder. Open up “Advanced Settings.inc” in a text editor such as Notepad or Textedit and make changes at your own risk. Since Storyboard IS blogging software, and the images that Storyboard creates are intended for the web, we have hardwired the ‘save for web’ engine into Storyboard; meaning that you can trim down your file sizes and make your blog load even faster. Choose from 0-100 for file save quality. Just head over to out new product update site to get this new version! awesome 🙂 will try it out this week!